Ok, so I am sharing this recipe and technique with you ONLY because I want you to see, I do my share of messing up too! I have no idea what got into me, I just had to try this. I am no cake decorator, or baker, OBVIOUSLY, but I gave it the old college try. Even though it looks ok, it technically is not a success. Let me explain. The red and white cakes should have been cut into 3 layers and since I used 9 inch pans, they weren't tall enough to do that. I cut them in half and called it a day. So there SHOULD be twice as many stripes if you get what I mean. I am going to explain the technique before I give you the recipe, because the only recipe involved is for this amazing frosting. I used box cake mixes, feel free to use a recipe from scratch. For me, this cake was more about the method than that actual cake part. HOWEVER, if I make this again I will use cakes from scratch, they are just easier to move around and work with. Mix cake according to package directions. Spray your round 8 inch pans(9 if that is all you have and want to only cut it in half instead of 3 layers each) and lay them with parchment paper, if you like. I always do, but you don't have to. Set them aside. Divide the batter evenly into 3 bowls. Leave one bowl white, color one bowl red and the 3rd, will be blue. I only have 2 pans so I had to bake twice when my first cakes were cooled. Get all 3 cakes baked. Let come to room temperature and then I suggest freezing for 1 hour in the freezer. You will cut the red layer in 3 equal parts, (or 2 if you are making it like mine). Do the same with the white layer but DO NOT CUT THE BLUE LAYER. Now on a separate plate, repeat the process starting with your red layer (if doing 2 layers only) or your white layer (if doing 3 layers). Frost between each but do not frost the top. Now take a plate or round object that you can cut around. It needs to be a size that will leave you approximately a 2-3 inch border when placed in the middle of one of your cakes. I used a saucer. Lay it on top of the second set of red and white layers, in the middle, and cut around it carefully with a knife. You will be using the part UNDER the plate. You are basically cutting the middle out and you will not need the outside ring that you cut off. Use the same plate and place on top of the blue cake. Cut around the plate, being careful to preserve the OUTSIDE ring. You will not need the MIDDLE of the blue cake. 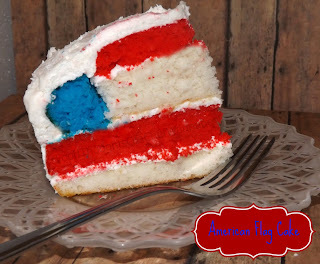 Now carefully remove the outside ring of the blue cake and fit over the top of the middle red and white layer you cut. So that you have a blue ring on the outside and red and white layers on the inside. If one cake is higher than the other, you can carefully trim it down or leave it. I am not even going to try and guess why this cake looks moldy on top. Lighting maybe, trust me, it wasn't! Frost the entire outside of the cake. You can decorate the top with sprinkles or whatever you choose. By the time I got to that part, I was so stressed out, it stayed white and plain! HAHA! Here is what I did NOT do that you SHOULD do. Here is the frosting I used. It is my brother in law's mothers recipe. It is fantastic! Combine all ingredients in a stand mixer or electric mixer and mix until light and fluffy. This will perfectly frost this cake, including in-between your layers.